Their discussions centred on how they could work as ECOWAS Ambassadors in an effort to improve and further strengthen relations among member states. Receiving his colleague at the Embassy’s Chancery building, H.E Jongopie S. Stevens welcomed Ambassador Dansua and stated the need for ECOWAS countries to maintain friendly relations and cooperation with all countries that desire such cooperation. He emphasised the main objectives of ECOWAS which he said, are to promote cooperation and integration in the context of an economic union of West Africa in order to raise the living standards of its people, to maintain and increase economic stability, to strengthen relations among the Member States and contribute to the progress and development of the African continent. While congratulating her colleague for her new task as Ambassador to Germany, Ambassador Stevens stressed on the importance of bilateral relations with particular emphasis on development cooperation between Germany and respective countries across Sub-Saharan Africa. Germany is one of Sierra Leone’s principal development partners, along with the United Kingdom, the European Union and the United States. Ambassador Stevens expressed belief that other countries in the sub-region are also benefiting from such cooperation. As a result of such cooperation, Sierra Leone under the present leadership of H.E Dr. Ernest Bai Koroma has made tremendous progress in several sectors among which include education, youth employment, agriculture and infrastructure. Ambassador told his colleague that the Ernest Koroma’s government places enormous importance on agricultural production and is making, for example, a growing contribution to the worldwide export of cocoa beans from West Africa. The government he further emphasised is also making efforts to create an enabling environment for foreign investment, particularly in the agricultural and commodities sectors, with a view to strengthening the country’s economic potential. In a bid to complement such efforts, the GIZ is currently implementing a programme in Sierra Leone to promote employment among young people on behalf of BMZ. This programme focuses on improving the employment and income situation of young people in rural areas and initiates development partnerships with established companies to create more jobs. Ambassador Stevens informed her colleague about the African Group of Ambassadors in Berlin that was set up with the ultimate aim to promote trade and investment in Africa. Since its formation he went on, the group has embarked on several activities geared towards showcasing the continent’s potentials and to further attract meaningful investors. The Ambassador further disclosed about the existence of Embassies representing the Southern African Development Community (SADC), thus the need for embassies from ECOWAS countries to have a similar representation that would work towards promoting a common future. Responding, Ambassador Dansua thanked her colleague for the warm reception accorded to her, and expressed enthusiasm to work closely with colleague Ambassadors in promoting a common goal for their respective countries and Africa as a whole. 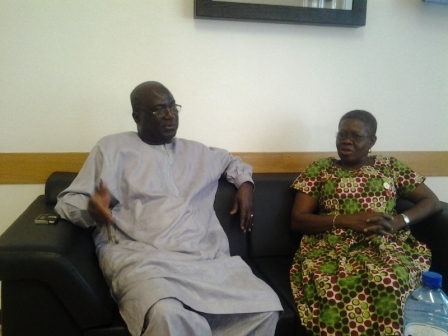 She stressed on the importance of ECOWAS Ambassadors to work in collaboration for the common good of the region.